Are you looking for Fathers Day gifts to make this year? Do you ever wonder what to give your father on father's day? It is often difficult to find just the right present. I have a couple of ideas that I've used in the past that may help you out. The best thing is, they are gifts to sew, so don't buy a gift! The first requirement, to finish these presents for men is you will need to know how to sew on a sewing machine to complete these gifts. You will find these are very easy Fathers Day gifts to make and can be completed in no time. The second is to have some scraps of fabric around. 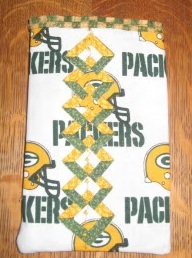 For the Dad's that love to BBQ, I've found one of the best fathers day gifts to make is a pot holder. Simply find a couple of cotton or linen dish towels and iron them so that they are wrinkle-free. Often you can find mismatched towels on the clearance table. Decide on what filler you want to use, such as wool or something like a thicker towel to put in between the layers. Do not use fiber fill as this will melt and not protect from heat. 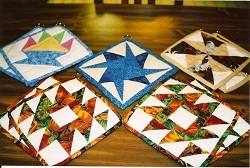 You could even make these from cotton and make up patchwork potholders. 1 - Use an old potholder for measurements. Add ½ inch around for seam allowance. Make a simple template. 2 - Cut 2 pieces of fabric and one of filler. 6 - Sew along three sides leaving just 3" free on the forth side. 7 – Clip the corners and trim off excess filler from seam. This cuts down on bulk when turning. You could make these in his team colors or a camo pattern. Other fathers day gifts to make are glass cases and golf club head covers. For the glass cases, I like to use a manly looking prints. You can buy small amounts of material at a sewing store, even 1/4 yard, which is more than enough to make 2 or 3 glass cases.You will also need a 2" piece of Velcro, which can be either stick on or sew on. Don't forget, you need both sides of the Velcro, i.e. the hooks and the loops. 1 -Simply measure the eyeglasses or sunglasses to make sure you cut the piece of material large enough. 2 -Cut your piece so that when you fold it in half it will be just large enough for the glasses plus 1/2". 3 -Turn the top end down 1/2" and sew across. 4 -Then fold right sides together an sew up the side and across the bottom. One of the sides is the fold so it doesn't need to be sewn. 5 -Then turn right side out and you have a case. 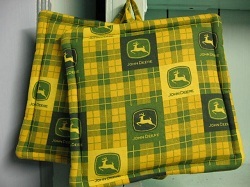 You can personalize it by embroidering his initials or "DAD" if you're feeling really crafty . Childrens Fathers days gifts to make. Even preschooler could do this project with some help from Mom. It is golf club head covers. Count the number of clubs, then find that many white tube socks. Cut them all the same length, about 6" or so, and write the number of the club on each toe. These are a funny way to show that you love him. This is especially easy for little kids to do as it really doesn't involve sewing unless you want to sew on some lace or trim to the cut on each sock.